See us on the map and give us a call to request an appointment! Have an auto or work Injury? Dr. Breiding is a participating provider with most insurances! Would you like to improve your health and reduce pain without drugs? Breiding Chiropractic Clinic is your chiropractor in East Greenwich RI. Your Rhode Island chiropractor, Dr. Breiding has done just that for its patients, including those in the surrounding areas such as North Kingston, for nearly 20 years. Dr. Breiding uses a combination of advanced techniques and traditional chiropractic methods to help his patients get better and stay that way. Dr. Breiding graduated at the top of his class and is board-certified. He is a member of the American Chiropractic Association and Chiropractic Society of Rhode Island. If you want to start living every day pain free, call us at 401-884-8687 to schedule an appointment. Breiding Chiropractic in East Greenwich is your RI chiropractor dedicated to helping people regain and maintain control of their health through a holistic, no drug approach. In our East Greenwich chiropractic practice, we believe in holistic care for our patients. That means we assess your entire body when you come in with a problem, not just the parts that hurt. We find there are usually underlying causes for the pain you feel, so we identify these to ensure we actually treat the root cause of your problem as well as providing immediate relief from pain. At Breiding Chiropractic, we adhere to the highest medical standards to effectively treat your symptoms and conditions including back pain, neck and shoulder pain, muscle pain, sciatica, pregnancy pain, headaches, scoliosis, TMJ and carpel tunnel. We also treat conditions related to auto accidents, work injuries, and personal injuries. Learn more about our practice. Chiropractic is the leading drug-free recovery method in the world today. At Breiding Chiropractic in East Greenwich and just a short drive from North Kingstown, we use the latest advancements in technology in East Greenwich, including mechanically assisted tables and touch screen digital workstations in every patient room. 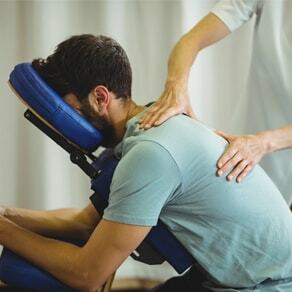 We offer several methods of chiropractic adjustment and we are technique focused; we select the most appropriate technique for the individual patient's needs. We also use ultrasound, mechanical traction, and muscle stimulation. Dr. Breiding has additional interest and specialization in nutrition, medicinal supplements and sports physiology to round out our practice offerings. We employ several techniques including Specific Spinal Adjustments, Physiotherapy, Custom Orthotics and Manual Therapy to treat pain. If you are new to seeing a chiropractor and live near North Kingstown, East Greenwich, or anywhere else in Rhode Island, please email us or call 401-884-8687 to receive personalized answers to your questions from our friendly team. We also welcome referrals, so feel free to use the "Send to a Friend" link located at the bottom of every page to share our health information with your friends and loved ones. New Patients A Receive a Free Reusable Ice Pack! Sign Up Below! We use Angie's List to assess whether we're keeping valued patients likeyou happy. Please visit AngiesList.com/Review/9110329 in order to grade our quality of care and customer service. "Dr. Mark has a personal, kind touch that is rare in area chiropractors. I met Dr. Mark through the community and he has treated some of our clients. He works well with physicians and other providers, is well-trained, and detail oriented." Dr. Breiding is a Participating Provider with most insurances! !